Nathaniel Currier and James Ives’ 19th-century lithographs of snow-crusted fields, frosty farmhouse windows, and families bundled on one-horse sleighs still adorn our holiday cards. The day after Thanksgiving in America, or what is called “Black Friday,” which falls on Nov. 25 this year, traditionally marks the unofficial start of the holiday shopping season. What retailers hope will be lusty consumer spending during the winter holidays is fueled, in part, by our cozy images of the season. Nathaniel Currier and James Ives’ 19th-century lithographs of snow-crusted fields, frosty farmhouse windows, and families bundled on one-horse sleighs still adorn our holiday cards. 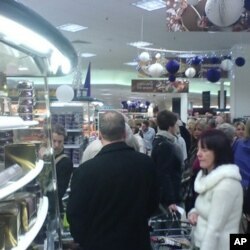 While holiday images are warm and fuzzy, the reality of the shopping crunch is something else entirely. Sad to say, though, that while gift-giving is still an integral part of the holidays, you don’t see many contented shoppers. Or, for that matter, carolers, horse-drawn sleighs or miniature villages in charming Christmas window displays. Most downtown department stores that put them up are out of business, replaced by chain stores in suburban malls. And retailers, nervous about the state of the economy, aren’t waiting for Thanksgiving weekend to put up tinsel and Christmas trees. The decorations are already up in thousands of towns across the country. The National Retail Federation is projecting a modest 2.8-percent gain in shopper spending this holiday season. Computers were stirring - keyboard, modem, and mouse?"